First Lady Melania Trump's fashion choices are "not America First," according to the Associated Press. A Monday article addressing the first lady's wardrobe declared "Melania Trump's style evokes Europe roots, not America First." AP reporter Thomas Admason credited Trump, who grew up in Slovenia before moving to Paris in the 1990s, for staying "true to her roots," and being "unafraid to go against her husband's ‘America First' agenda." Admason described the first lady's fashion choices as "keeping with the expensive personal taste she’s acquired since marrying Trump in 2005." The article goes on to assume her choice to wear designer clothes would be an issue to her husband's supporters. "As the wife of a billionaire, Mrs. Trump can afford to spend into the five figures for a garment and seems unconcerned about how that squares with voters in President Donald Trump’s political base," Admason wrote. The piece also contrasted Melania Trump's fashion choices with former First Lady Michelle Obama. Admason described how Trump's clothing choices are typically bought off-the-rack, without collaborating with a designer, while Obama often worked with designers. "This is highly unusual — and contrasts with Mrs. Obama’s frequent collaborations with designers," Admason said. Admason theorized that one reason Trump may not collaborate with designers is because of the potential backlash designers could face if seen to support the first lady and Trump presidency. Many may have heeded lessons from the unpleasant experience of a few designers who have supported Mrs. Trump publicly — such as Ralph Lauren, Dolce & Gabbana and Beirut-born Reem Acra. They all faced criticism on social media and would not comment to AP. Stefano Gabbana told his online critics to "go to hell" when he revealed himself to be among Mrs. Trump’s most passionate supporters — posting a photo of her in D&G on his Instagram account to instant criticism. And when Mrs. Trump wore Ralph Lauren at the White House, some even threatened to boycott the house. The piece reported the AP asked designers, which have been worn by the first lady, for comment, but did not receive responses. Admason said, in contrast, designers "generally were eager" to talk about dressing Obama. "It’s a deafening silence, especially given that it’s an industry Mrs. Trump actually worked in," Admason wrote. According to the AP, Melania Trump's style contrasts with Obama's "buy-American wardrobe" and "relatable image she honed." Admason notes that Trump's iconic looks have at times been "gushed over," but she has also been targeted for making "impractical" choices." He notes particularly a time she wore high stilettos when leaving the White House to visit hurricane-damaged Texas. 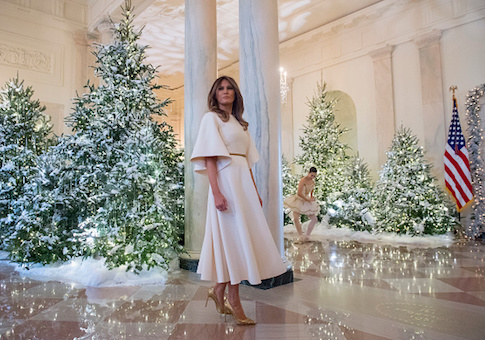 What the AP culture correspondent fails to note is it was primarily the liberal media who were up in arms about the first lady's footwear choice. This entry was posted in Culture and tagged Associated Press, Melania Trump. Bookmark the permalink.